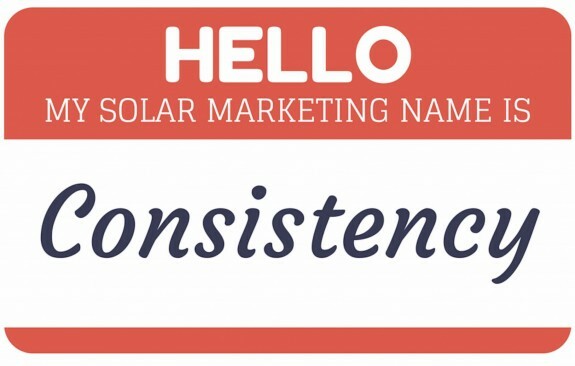 Solar marketing with consistency will bring success over time. Marketing pros will think that what I really mean by “consistency” is “repetition,” and while repeating a message over and over again is certainly a part of the above formula, consistency is much more than mindless repetition. I see a lot of repeated, boring, consistent solar banner ads, and yeah, that can generate brand awareness, but at what cost? Tens of thousands of dollars over several months in some cases, and for what? A fraction of people clicking on your ad, and of those, another fraction actually converting. Today it’s easy to mechanically repeat the same solar message forever if you can afford it, but if that message doesn’t truly resonate with your audience, what’s the point? And speaking of repetition, “Save on your electric bills with solar!” or some version of that is repeated by so many solar companies, who can tell the difference? So, yes, repeat effective solar messaging, but that’s not what I mean by consistency, a far more comprehensive term. Consistency means dedication. You’re dedicated to your customers, and that means always finding ways to serve their needs, including reducing dollar/watt, but also increasing education and creative outreach if that’s what it takes to help them understand the value of your solar product or service. Consistency means predictable timing. I messed up this week, and that’s the reason behind writing this post. Regular UnThink/Solar Fred readers usually read this blog every Wednesday here on Renewable Energy World or through my newsletter, but I missed yesterday’s deadline. Mea culpa. We all have priorities and unexpected exceptions, but in the best of all solar marketing words, this post should have been live yesterday to be truly consistent. I care about my fellow solar marketers, just as I’m sure you sincerely care about your customers. So if I’ve made a personal commitment to post some marketing blog post once a week, then I have to try my level best to be consistent, even if few notice that I’m a day late. If you write a blog for your solar customers, whether B2B or B2C, you should also be consistent. Set up an editorial calendar, write your post, edit it, and get it online at the same time every day or every week or every month. If you’re not consistent with your communications—your blogs, newsletters, Tweets, Facebook posts, press releases, infographics, videos, customer response times, and thank you emails—your customers will rightly think that you believe that these communications aren’t important. Worse, your customers will think that they’re not important to you, and they’ll gravitate to companies that do provide consistent, valuable solar education and outreach. Consistency means committing to a reasonable amount of time. We’d all love to have instant success, but only lottery winners get that, and there’s a reason that there are very few of those winners. For non-lottery winners, consistency means giving your solar marketing and PR efforts a reasonable amount of time to succeed. That time frame could be three months, six months, or a year, depending on your solar products, service, or customer targets. Some type of metrics can show your progress, and that’s fine. Make adjustments, experiment a little, but don’t half bake a marketing or PR campaign, turn off the oven, and throw the entire campaign into the bin. Consistency is useless without allowing for time. Tweak the wording, try a different social channel, change the days, switch publications, release at a different hour. That’s all okay, but have some patience, especially when you have metrics that reveal how your target market is reacting to your campaign. That being said, no one should bust their marketing brains and budgets against a brick wall. Stubbornness in the face of poor performance metrics ain’t the same as consistency. Reliability—Such as being on time for solar sales appointments. Conveying the same brand promise to everyone, not just selective clients. Transparently apologizing for mistakes and oversights—and making them right. Having the same messaging throughout the organization. Training and developing new employees. Testing solar products for defects. Correcting defects, even if that means a recall. Finding creative ways to improve products, customer service, management, quality control, and of course…consistency. Creativity, consistency, dedication, patience, these are some of the ways…to UnThink Solar. Glad we could help, Joel!